Hello TCS families. I hope everyone has had a good week. I Corinthians 15:3,4 says, “For what I received I passed on to you as of first importance: that Christ died for our sins according to the Scriptures, that He was buried, that He was raised on the third day according to the Scriptures”. As we prepare to celebrate Easter, we can praise the Lord for the tremendous Gospel message shared in these verses. Here are a few news items that we wanted to share with you. 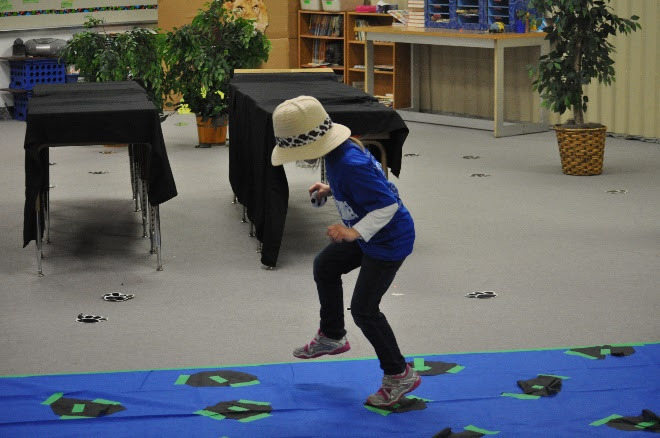 Elementary students had a blast last Friday during our big reading month finale. 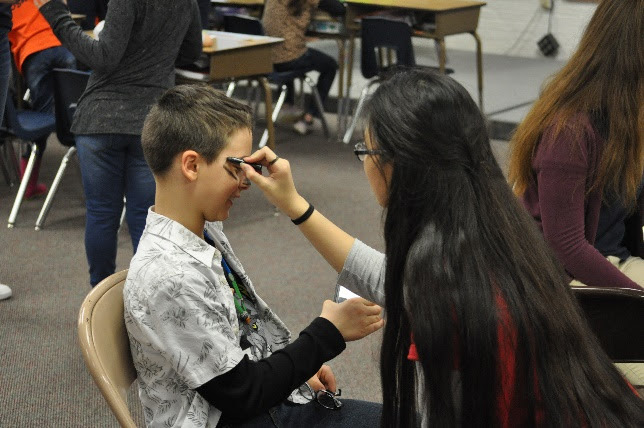 Students participated in a variety of activities including face painting, obstacle courses, and Lego challenges. Here are some pictures of the day’s events. The TCS spring musical and art show will take place on April 11-13 in the LBT main auditorium. 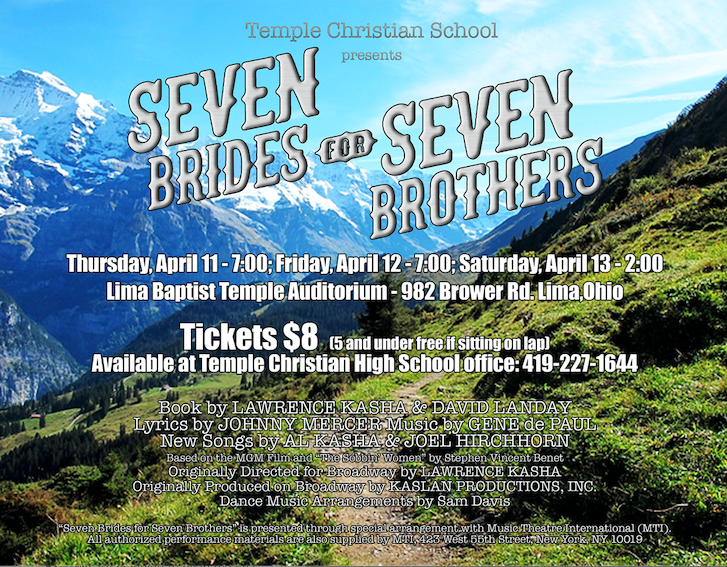 The students will be presenting Seven Brides for Seven Brothers. Tickets are $8 and are being sold in the high school office. 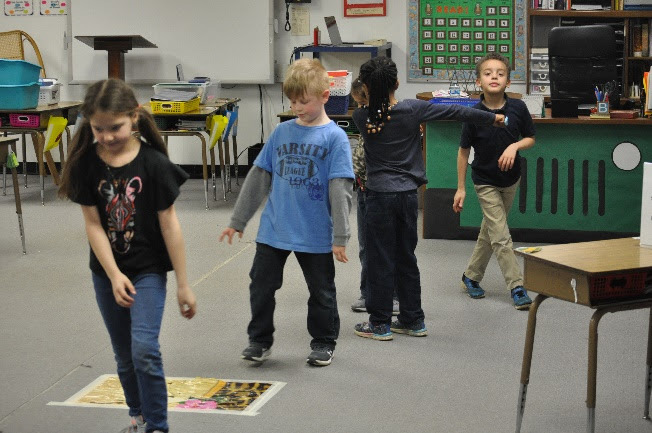 In addition, Mrs. Phillips and the TCS art students will be presenting their annual art show. Please make sure to mark your calendar for this exciting event. Forty high school students qualified for 3rd Quarter Pioneer Rewards Lunch this week. Students had the opportunity to go to lunch at Golden Corral. 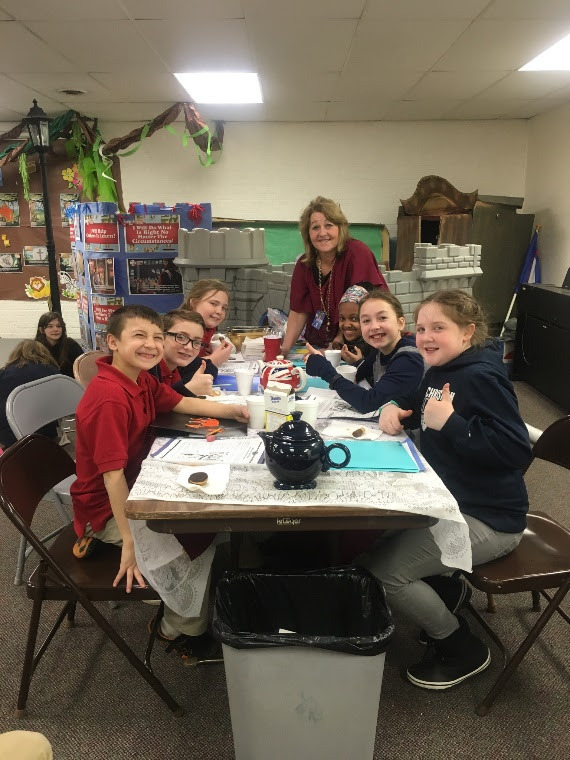 Thirty-five middle school students had the opportunity to attend middle school rewards Wednesday, which consisted of a movie, free time in the lunchroom, and plenty of candy for all who attended! The Converge Youth Conference will be taking place on April 5 and 6 at Elida High School and the Elida Fieldhouse. 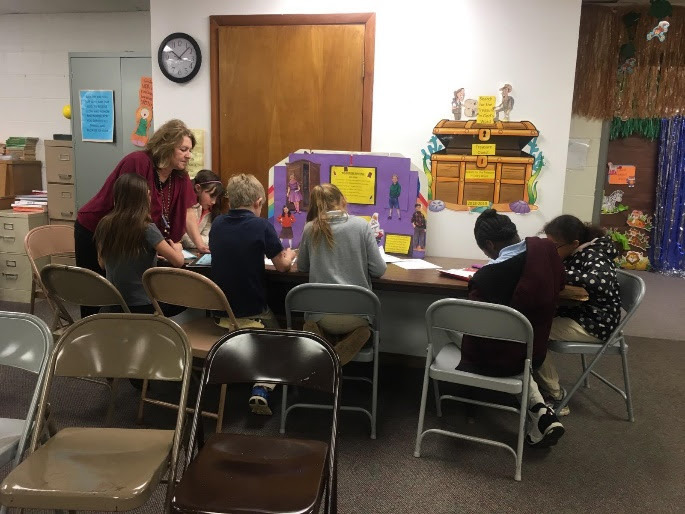 Over twenty-five TCS students are planning on attending the event. The yearbook order deadline is May 10th! Order your 2018-2019 Temple Christian yearbook for only $40.00. Add name personalization on the cover for $5.00. Return the order form with cash or check payable to Temple Christian School (memo: Yearbook) to Mrs. Searcy or either office, or order online with a credit card at jostens.com. Contact searcys@tcspioneers.org if you have questions. The 4th Grade is eagerly anticipating the annual Narnia play! We read the book, The Lion the Witch and the Wardrobe. 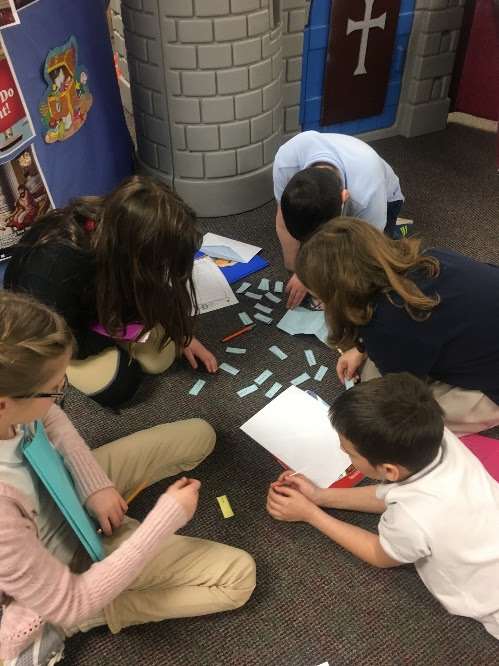 We did enrichment centers, which included lamp post list vocabulary and wardrobe writing. It also included compare and contrast activities where we compared various characters from the book like Aslan, the Lion and the White Witch. We also had Tea with Mr. Tumnus, which included actually having tea and small cookies or biscuits, as the English would say, as they discussed the story. It was a great learning experience! It was also a very fun learning experience! We have had tryouts for the play, and we are looking forward to the Narnia Play performances on May 15-17! We love this story, as it has fun characters and symbolism that compare the great lion Aslan to Jesus and his death and resurrection!! It is a great study, as we enter this Easter season! 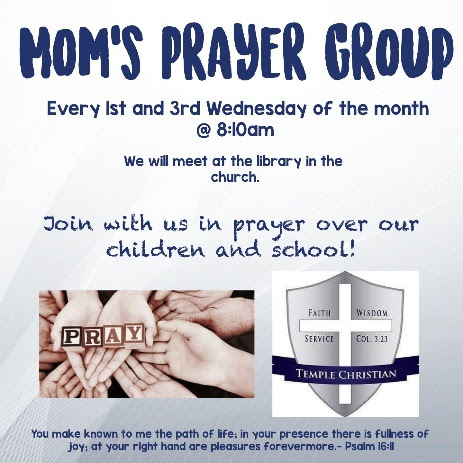 Our Mom’s prayer group is still meeting on the 1st and 3rd Wednesday of every month at 8:10 a.m. in the library across from the women’s restroom in the church. All moms are invited to join us as we cover our students, staff, teachers, and administration in prayer! If school delays or cancels, we cancel. Please assist us with the recruitment of new potential families. There is a $300 discount for referring a family that is accepted and stays at least half of the 2019-2020 school year. See the elementary office for more information. Apr. 9 H.S. Track and Field at Hardin Northern @ 4:30 P.M.